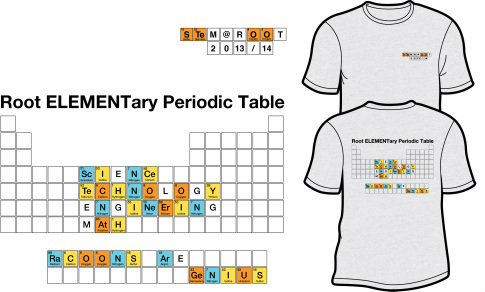 2013/14 STEM @ Root T-shirts!!! Show your excitement and support for Science, Technology, Engineering, and Math (STEM) education by wearing our third annual STEM @ Root 2013/2014 t-shirt! This year’s t-shirt is gray with our STeM @ ROOT 2013/2014 on the front. On the back is the 2013/2014 theme, “RaCOONS ArE GeNIUS!”(blue, red/orange and yellow) on the "Root ELEMENTary Periodic Table". They’re not just cool for Root students, but for parents, teachers, and siblings too! We encourage students to wear their new STEM @ Root t-shirts on all our STEM Fridays throughout the year (Sep 27th, Nov 8th, Feb 14th, Mar 7th), STEM @ Root Fair on Feb 27th and on Thursday, April 24th for our STEM Family Night @ Root!! Children and Adult shirts are $12 each and can be purchased online (Rooty Retail Online) through March 19th or at our Rooty Retail Store, open at Open Houses, General PTA Meetings and Book Fair Family Nights. Please turn your t-shirts orders !